Sean Mullen and Aaliyah Wilson: Two Mustangs "Branded By Excellence"
“We Are Mustangs...Branded By Excellence.” These words hang over the students of Stockdale High School as they walk through the quad of their campus each day, reminding them of their responsibility as a Mustang in and out of the classroom. From David Carr being selected as the first pick of the NFL Draft, to countless CIF Central Section volleyball championships, to the 2017 World Champion Colorguard team, to a wide array of academic success both in competition and in the classroom, to many other accomplishments, it is safe to say that Stockdale High School has indeed been “branded by excellence.” The 2017-2018 school years has not been any different for the students of Stockdale High School. 12 seniors signed letters of intent to play athletics collegiately further demonstrating that achieving excellence is very much part of the fabric of Stockdale High School. 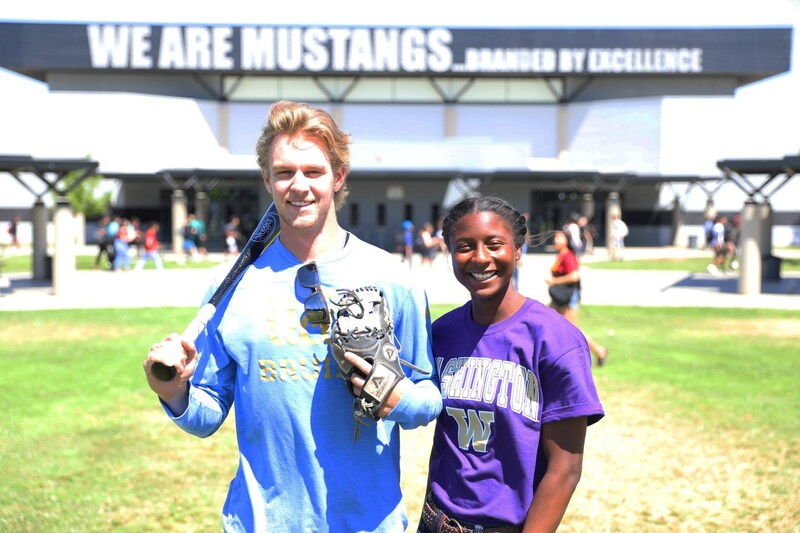 However, for two Mustangs, not only have they been “branded by excellence,” they have changed the landscape of Kern County athletics as they gallop towards the PAC. Aaliyah Wilson improved on the 100m Hurdles by over 1 second from 10th to 11th grade. Aaliyah Wilson has always been fast, running with a lot of tenacity and determination. With her tenacity, determination, and success, Wilson was recruited for her ability. One of the schools that actively pursued her was Fresno State University - the school in which her father was a wide receiver on for the football team in the 1980s. However, Wilson was not 100% sold on being a Bulldog. “I was set on going to Fresno State University because it was one of the only major schools interested in recruiting me. Something inside told me to wait and I am glad that I did.” As a result of her patience, the University of Washington (PAC 12) offered Wilson a full track scholarship. “I am excited to be a Husky. Bakersfield has shaped me into the person that I am today, but I am excited to go out and see the world; in a place that is slightly cooler,” jokes Wilson. played football at Fresno State in the 1980's. “At Stockdale we are so proud of Aaliyah and all of her accomplishments,” notes Athletic Director, Justin Roberts, “We all know of how special of an athlete she is, but she is also a great student, been involved in the band for four years, and donates her time to volunteer at the hospital. I have no idea how she can get so much done in a day and be phenomenal at everything she does.” Longsinger continues, “Aaliyah is understanding her role as an upper level athlete while maintaining a very unique and humble demeanor.” Aaliyah Wilson is tenacious, determined, and “branded by excellence,” galloping towards the University of Washinton and the PAC-12. Aaliyah Wilson will run track at the University of Washington next year on a full scholarship in both 100m and 100m Hurdles. With a new maturity to the game he loved, Mullen’s production increased. Offensively, Mullen hit .312 with 19 RBIs and 1HR, but it was his arm that on the mound that saw a big increase. Mullen finished his sophomore campaign with a 8-3 record, 1.94 ERA, and 65 strikeouts in 14 appearances. “His overall improvement from his freshman to sophomore year was night and day,” stated Head Coach Brad Showers, “He learned to become a pitcher that year - not just a kid that could throw hard.” With his impressive ability on the mound, Mullen started to get a lot of attention from schools all over the nation including powerhouse schools like the University of North Carolina, Duke University, the University of Oregon, and UCLA. This year, Mullen is continuing to grow, develop, and maintain his presence as a baseball superstar. “Sean is a four year varsity kid at a Division 1 school, which is extremely rare. This year, everyone takes notice where Sean is on the field.” says Showers. Currently, Mullen is batting .398 AVG, 33 hits, 6 HRs, and 27 RBIs. On the mound he is 6-1 with an impressive 1.68 ERA and an even more impressive fastball. “On average, Sean hits 92-94 mph with his fastball and every game he gets at least 95 mph once,” indicates Showers, “He has evolved into a three to four pitch pitcher with a 2 seam, 4 seam, changeup, and slider.” But more than his gaudy numbers and his rocket arm is his presence. Fellow superstar and teammate, Jalen Smith stated, “Sean has a calm presence about him that we all try to follow. When things aren’t going our way, Sean calmly tries to carry us to victory. He is a great teammate.” Coach Shower feels the same way. “I am going to miss Sean. He commands such a presence that others want to follow. Kids with his skill set, mental toughness, and presence don’t come around too often.” As Mullen warms up for practice and takes grounders from coach, his mental approach to the game is noticed. “Our goal is to win a league title, but our ultimate goal is a valley championship. We have to get fine tune our approach in practice because when we play how we can truly play - we can’t be beat,” states Mullen. Mullen is focused, mentally tough, and “branded by excellence” - galloping towards the PAC.